In 2010, while promoting The Social Network, Max Minghella revealed that before he wanted to act, his original teenage dream was to direct music videos. Nine years later, the Handmaid’s Tale actor-turned-writer-director finally gets to live out that adolescent fantasy in his debut feature, Teen Spirit, which is as much a series of music videos as it is a movie. That’s not a knock. What Teen Spirit lacks in depth, it makes up for with spirit and style. This simple Cinderella story of a small-town girl with big artistic dreams is nothing you haven’t seen many, many, many times before. Yet in a film seemingly aimed more at teens than adults, Minghella effectively updates that familiar star-is-born template for an arthouse-minded Instagram generation. Elle Fanning stars as Violet Valenski, a Polish-born British teenager living on the Isle of Wight. (That’s where the filmmaker’s father, writer-director Anthony Minghella, was born.) Violet’s days revolve around school, a dreary restaurant job, helping her sullen mom manage their small family farm, and occasionally sneaking out to sing at a local pub. Her only fan is an alcoholic former opera singer named Vlad (Zlatko Buric), who becomes her unexpected ally when an American Idol-style singing competition rolls into town to hold a first round of auditions ahead of a big televised finale in London, with the promise of a potential recording contract for the winner. Despite Violet’s lack of training, her raw talent makes her an immediate standout. Soon enough, she’s entered the crazy world of reality TV competition, becoming a hometown hero along the way. Minghella initially takes an appreciably understated approach to his storytelling, zipping past the details of the competition to instead zero in on the emotional heart of the material. Still, Teen Spirit would be stronger if Violet’s feelings about her rise to pop stardom were better defined. It’s never quite clear if she’s swept up in the momentum of the competition or actively working to win it. What is clear is that Violet loves to sing. She auditions with Robyn’s “Dancing On My Own,” and Minghella turns her first big performance into a montage highlighting Violet’s long personal connection to the song—from casual at-home sing-alongs to pub performances to her unshowy pre-audition audition. Fanning’s got impressive pipes and an appealing dressed-down loner energy that helps paper over the fact that Violet, like all of the film’s characters, is really thinly drawn. The energy of Teen Spirit dips a bit in its second half, as it puts the competition more front and center, and trades the unique personality of its Isle of Wight setting for a more generic London one. (That’s also where logistical questions start to arise: The climatic televised performance is so ridiculously underlit as to throw any sense of realism out the window.) But the film isn’t really about the behind-the-scenes politicking of the competition or even Violet’s father/daughter dynamic with Vlad, though both get a decent amount of screentime. Instead, the true arc of Teen Spirit is about Violet’s growing confidence as a performer, which unfolds across three big musical performances. Working with cinematographer Autumn Durald, who’s collaborated on music videos for Janelle Monáe, Solange Knowles, Haim, and Arcade Fire, Minghella gives each performance its own distinct visual style. 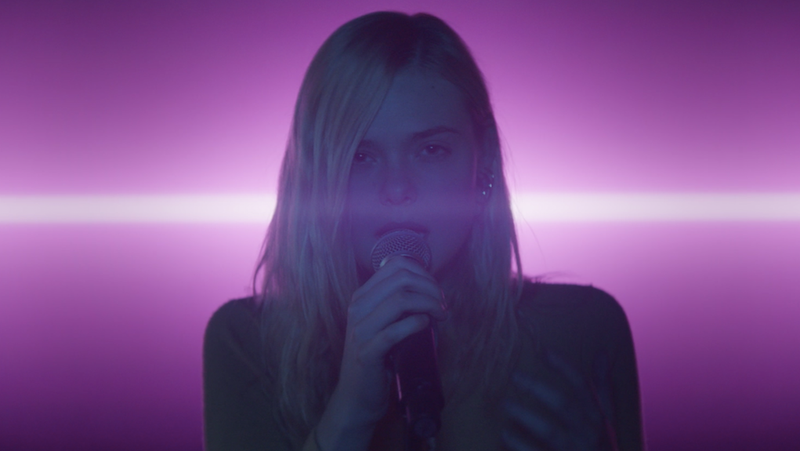 In addition to “Dancing On My Own,” there’s Violet’s dramatically lit, fiercely performed cover of Ellie Goulding’s “Lights.” For her big climatic performance of Sigrid’s “Don’t Kill My Vibe,” Minghella keeps things more stripped down to lock us into the experience of Violet fully embracing her onstage persona. Equally thrilling is her visceral emotional reaction at the end of the song—not to winning or losing, just at having made it through such a high-pressured event. Save for an original song that plays over the credits, the film’s musical numbers are all covers. That’s fitting, because what Teen Spirit evokes more than anything is the feeling of being a teenager dancing in your bedroom to a pop song that feels as if it was written just for you. (There’s a scene of Violet doing just that to No Doubt’s “Just A Girl,” which is having quite a moment this spring.) Teen Spirit may not have anything particularly meaningful to say about the music industry or young adulthood, but thanks to its infectious pop score, Fanning’s compelling performance, and Minghella’s clear affection for the material, it soars as heartfelt teen pop fantasia. No doubt its soundtrack will soon inspire joyfully uninhibited dance parties among its young fans—and maybe even a few older ones, too.